When Ronda Rousey admitted to feeling suicidal after her devastating loss to Holly Holm on her appearance on The Ellen Show on Tuesday, the news was met with the same progression of hype, (over)exposure, frustration, and dismissal that seems to follow in the wake of any Rousey-related news these days. This is somewhat understandable—a certain amount of Rowdy fatigue is probably inevitable if you follow MMA in any depth, which makes it tempting to want to tune out the latest bit of news in a seemingly endless onslaught of stories and analysis on her every move and Instragram post—but it’s also unfortunate, because what she actually said has given us a unique opportunity to more openly discuss mental health in mixed martial arts. The conversation surrounding mental health in professional sports is, at best, in its infancy, still struggling to reconcile centuries of narratives about intense focus, superhuman discipline, and giving 110% with the realization that even the most talented and driven professional athlete can’t simply will themselves into a perfectly functioning psyche. And one-on-one combat sports like MMA have been particularly resistant to this concept. Most people involved in the sport in any capacity have come to martial arts through stories about stoic warrior heroes and training that stresses the importance—and the unquestionable attainability—of mental discipline. When you combine that with a hyper-competitive and tough sensibility, which MMA has boasted for most of its existence, you don’t foster a culture that has much of an ability to tackle complex psychological issues in a meaningful way. There have been hints of serious discussion in the MMA world. Nick Diaz has talked about having fight-induced anxiety. Georges St-Pierre opened up about his OCD after stepping away from the sport. Andrei Arlovski has admitted to playing Russian roulette more than once in his life, and sought the guidance of a sports psychologist after his loss to Fedor. For the most part, though, we in the greater MMA community tend to stick to a far more simplistic idea: if you want it bad enough, you get your head in the game, and you win. That idea isn’t wrong, but it’s only part of the picture. A good mindset is as integral to a fighter’s game as their physical shape and skill. But the mind isn’t a switch that you can turn on and off into game mode unless you’re incredibly lucky. It’s a lot like an athlete’s body in the sense that you can do everything right and still face injury and illness. If we can accept that athletes must learn to work with the physical limitations of a human body, surely we can accept that they also have to work within the limitations of a human brain. Perhaps ideally, a confession like this could have come from a less polarizing source. Maybe MMA fans would be more responsive to this confession from someone who isn’t constantly in the limelight, and who isn’t just as likely to say something problematic or unsportsmanlike as something inspiring. But people who are willing to talk about mental health are rarely the perfect victims other people want them to be. They’re as human and fallible as everyone else, and they’re not likely to produce the perfect stone-faced explanation and renunciation of suicidal ideation that would truly speak to the MMA mindset right now. Given how little we do openly talk about mental health issues in the greater MMA community, this type of guileless admission couldn’t really have come from anyone else, either. It had to be from someone who had enough of a profile outside of the sport to have access to a relatively safe platform like a daytime talk show on which to spill their guts, which is something only Rousey really has right now. The initial response to her confession may have proven that she was right to take it outside of the sports world. In general, the comment sections of any story on the internet are not going to be a hotbed of sophisticated discourse, but the commentary surrounding this news was particularly vicious and ill-informed. Many keyboard warriors accused Rousey of faking the moment, which is ridiculous. Given what we’ve seen of her current acting talents, we all know that unguarded, ugly-crying vulnerability is not yet in her wheelhouse. Even more believed that she was making excuses for her loss, and that her moment of catastrophic thinking in the face of public defeat and humiliation meant that she was unfit for the sport, as if anyone could have handled such a fall with perfect grace. Even some of the responses that came from a more compassionate perspective, like the advice about learning to lose that Brock Lesnar and Mike Tyson offered in recent interviews, leaned toward the simplistic: depressive episodes are bad and weak, but she has to/can get over it. End of story. 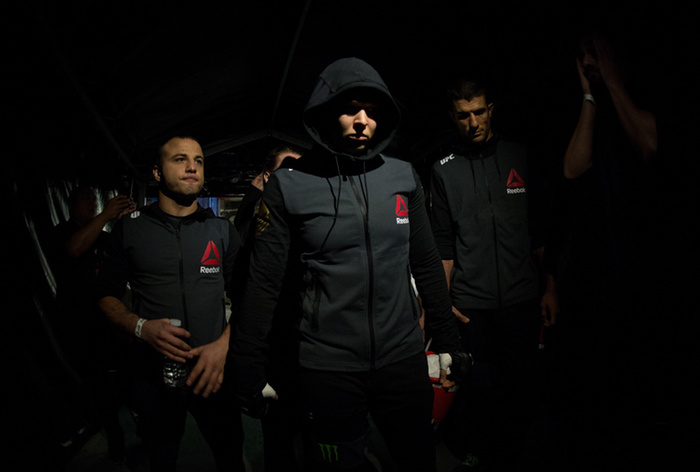 But there has been some promise in the post-Ellen fallout as well, particularly Ben Fowlkes’s thoughtful analysis of post-concussion syndrome and suicidal thoughts and the role that all-or-nothing thinking can play in the sport at MMA Junkie. This type of perspective doesn’t just offer hope that MMA can learn to accept imperfect mental health, but also that the community can embrace the more complex and compelling narratives that come along with more open discussion on the topic. The human body and the human brain are fascinatingly complicated, and the incredible amount of skill and self-knowledge that it takes for a successful athlete to keep both in working order is a truly stunning thing to behold. The physical and mental challenges their minds face in and out of competition is incredible. It doesn’t diminish or weaken them to discuss these things with compassion and understanding. If anything, creating an environment where athletes don’t have to hide their mental issues or feel great shame over them allows them to treat them like they would any physical health concerns which, in turn, could help to make them even better at their discipline. It certainly makes them even more interesting to watch.